Ask fellow campers about "Lake Pan RV Village (formerly Lake Panasoffkee I-75 KOA)" and nearby attractions. As mentioned by others, this is primarily a snow bird location with seemingly few available spots. They had activities the night we arrived and breakfast the next morning which were well attended by the locals. The office was neat with a few items for sale and the duty manager was helpful and guided us to our spot. I didn't notice any of the road noise that others mentioned and heard the occasional train. The site was fine for an overnight stop (good water, electric, etc) and we were happy to take the last spot available. (All other places were full, so call early on the day you want to stop) Sites were fairly close, but reasonable. 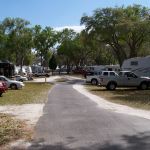 We camped at Lake Pan RV Village (formerly Lake Panasoffkee I-75 KOA) in a Motorhome. This pleasant park has a few overnight pull-through spots but is mostly a long-term facility. The sites are mostly open but we managed to get a tree limb in the way of our dish. Analog cable provided only SD channels. Wi-Fi was very good. A pretty lake with dock and porch swing is at one end of the park. Close to I-75 but traffic noise was muted. Access from the Florida Turnpike is easy via good county roads. We camped at Lake Pan RV Village (formerly Lake Panasoffkee I-75 KOA) in a Motorhome. Very rustic would be generous description. Old mobile homes throughout the park. Not very attractive. Don't count on shade. Some trees but many sites, like our big site has no shade. Sites not very level and loose sand that end up all inside your rig. Dog park is a joke. Poorly maintained chain link fence, very small area to run... the bathhouse near the office has one stall and one shower. Stall so small your knees hit the door. No real activities for kids, families, the shuffle courts and horseshoe are are not well maintained either. Not really in Lake Panasofkee; more like on a swampy canal the goes to the larger lake. Very noisy as well. Very close to I75 and railroad tracks. Train lays on horn for long time to cross main road. The trains never seemed to stop. The pool area had no bar activities or breakfasts going on. Pool is very very small, but area was clean. We ended up leaving early. We camped at Lake Pan RV Village (formerly Lake Panasoffkee I-75 KOA) in a Travel Trailer. We stayed in a section best suited to overnight stays. The pull-throughs are easy to get into and out of, and the hook ups are well placed. The crushed sea shell and gravel paving tracked into our coach despite wiping our feet often. The office staff is friendly and helpful, but the nearby train whistles are quite loud, especially during the night. Verizon voice and data service is very good. A low cost ($3.50) breakfast is available in the activity building on Saturday mornings. There are a lot of permanent and seasonal folks, and everyone was friendly. We camped at Lake Pan RV Village (formerly Lake Panasoffkee I-75 KOA) in a Motorhome. This KOA is old and in need of a face lift. The park is on Lake Panasoffkee, but only two or three sites can see the lake. There are airboat rides from the park which allows for close up viewing of Florida wildlife. The pool is clean and safe. The staff is terrific. They are kind and caring. This park has at least 20 very old RVs that are from to 1970s or 1980s and they had roof overs, rooms added, mold and mildew cover many of them. Looks like Section 8 housing, only worse. This could be a nice park. Beautiful oaks, the lake, nice employees. We camped at Lake Pan RV Village (formerly Lake Panasoffkee I-75 KOA) in a Motorhome. Fair value for the money, but the site I was allocated was not easy to get in to, or out of, despite being a "pull through". Campground has a lot of long term residents, park homes, and looks a little disheveled because of it. At check in they seemed more concerned about trying to sell me an air boat ride than getting me registered! I would not stop here again. We camped at Lake Pan RV Village (formerly Lake Panasoffkee I-75 KOA) in a Fifth Wheel. Very nice older Snow Bird Seasonal site. Sites much larger than other Florida Seasonal sites we have visited. Staff is very helpful and friendly. We stayed on site 8 a very spacious gravel site with a large adjacent grassy area. We stayed here one night. It happened to be the season ending Luau for the regular tenants and we were invited to participate. Location has pool, docks, and available air boat rides. We would stay here again. We camped at Lake Pan RV Village (formerly Lake Panasoffkee I-75 KOA) in a Motorhome. The park is located on Lake Panasoffkee and while none of the sites are waterfront, they do have their own boat ramp, docks and air boat rides. Lots of tall trees covered in Spanish moss create plenty of shade. The pool, laundry, clubhouse and bathrooms were clean and well maintained. Very friendly and helpful staff and permanent residents (about 75% of the park are permanent residents in well maintained clutter-free RVs). Site spacing is about average. Interior roads are narrow and need work. Our site was very soft sand and the last party in that site had to be towed out. We'd say the park is just a little bit of work from being an 8 or 9 overall. We camped at Lake Pan RV Village (formerly Lake Panasoffkee I-75 KOA) in a Motorhome. We stayed here for 2 nights. We stayed at site #8 pull through. Cable TV is available but we used satellite service; Wi-Fi is available and is acceptable for general use. There are many seasonal residents here. Commercial air-boat tour of the lake that operates from the park launch ramp area. Campers receive an extra discount. We choose to give the park an 8, as this is a older park in the area. Pool is closed for the season. Plus this is really a seasonal park and spots available for RVers. We would stay here again, as we do not need high end RV parks. We camped at Lake Pan RV Village (formerly Lake Panasoffkee I-75 KOA) in a Motorhome. The price reflects a weekly charge less our KOA VKR discount. We stayed here for 9 nights, and had a great time seeing the area attractions. Our back in site was huge at about 40 feet wide, and had a large concrete patio. The cable TV service was good, and the WiFi was slow, but acceptable for general use. There are many seasonal residents here, and everyone we talked to was friendly and helpful about the area. There is a commercial airboat tour of the lake that operates from the park launch ramp area. Campers receive an extra discount, and the tour of the lake was fun and informative, with many birds, alligators, and even a few wild pigs spotted. The only negative we found was the annoying train whistles from the nearby tracks, both day and night. We will definitely stay here again. We camped at Lake Pan RV Village (formerly Lake Panasoffkee I-75 KOA) in a Motorhome. This park is now a KOA park; the name is now Lake Panasofkee I-75 KOA. This is an excellent small park. It has really clean showers and restrooms. Has a heated swimming pool, laundry room, fenced dog run, game room, and coffee room. River access to Lake Panasofkee with a small boat dock. Great hosts and park attendants. Quick access to I-75 and close enough to everything. Overall great stay! We camped at Lake Pan RV Village (formerly Lake Panasoffkee I-75 KOA) in a Fifth Wheel. I enjoyed my stay here. The staff is super friendly and helpful. Had it not been for a barking loose dog, I would have rated this CG a solid 10 Camped here in a class A towing. We camped at Lake Pan RV Village (formerly Lake Panasoffkee I-75 KOA) in a Motorhome. We stayed here for 10 days to visit my mother-in-law who lives close by with 4 kids. We were right in the middle of all of Florida's great attractions and the longest distance we drove was 2 hours to Daytona beach and it was over an hour to drive to Disney World, Sea World, etc., but we don't mind driving distances for attractions. Everyone was friendly here and the pool was great in the hot days and we were usually the only ones at the pool. Nice clean laundry room and restrooms. The campground is right on the lake so we could walk down and fish or just go check out the alligators. The only thing we can say is the country store does not have much. It is like a post office but they do sell ice. But there is a 7-11 right down the road from this campground so no big problem. The office is only open until 3 p.m. and closed on Sundays but there is security that patrols the grounds through the day and night hours. Most of the people live on the property but we did see a few come in for over night stays and then they were gone the next day. We had a secluded site majority of our stay with no neighbors right next to our site which we enjoyed!! We had such a great time here and hope to return soon!!! We camped at Lake Pan RV Village (formerly Lake Panasoffkee I-75 KOA) in a Fifth Wheel. This park has lots of large oak trees covered with the Spanish Moss that drops leaves and moss all over your camper. It is really messy. The lots and roads are really tight for the big rigs. This is mostly a fishing camp. We camped at Lake Pan RV Village (formerly Lake Panasoffkee I-75 KOA) in a Fifth Wheel. Difficult for us to rate this park, as it's really for fishermen, so for them it is great. The price is also very good, the buildings all very clean, heated pool and lots of activities. Guests do most of the arranging for the dinners and such. Not being fishermen, there's not a lot to do in the area. You must travel a bit to see movies, etc. They need to deal with the dogs barking and running around. The odor from the sewer plant can be overwhelming and some sites are extremely tight. Pick your site carefully. Some electrical problems and sewer line problems need to be dealt with. I understand this place has risen from the dead, so more time will produce more necessary improvements. People very friendly and extremely helpful. If you fish, this is heaven! We camped at Lake Pan RV Village (formerly Lake Panasoffkee I-75 KOA) in a Motorhome. Are you affiliated with Lake Pan RV Village (formerly Lake Panasoffkee I-75 KOA) ?